The Senate will hold its first procedural vote since the shutdown began. It's been 33 days since the government shut down over a political impasse centered on a border wall most Americans don't support -- and as many days have passed without significant movement on the Senate floor that could bring the shutdown to an end. And though that will change on Thursday, when the Senate holds procedural votes on two bills, one from Democrats and one from Republicans, neither bill is expected to pass. It would be the first time the Senate votes on a bill to end the government shutdown since December when the budget first ran out without a compromise reached and federal doors began to close. The Republican bill mirrors the president's proposal from Saturday -- a three-year extension to Temporary Protected Status recipients and around 700,000 so-called “Dreamers,” children brought to the U.S. illegally by their parents and given protected status under DACA, or Deferred Action for Childhood Arrivals, in exchange for border wall funding. Critics say the proposal undercuts some protections for immigrants. The measure proposed by Democrats doesn't include additional funding for a border wall and instead would fund the government until Feb. 8, giving time for negotiation while relieving 800,000 unpaid federal workers. The proposal is not new and was passed by the Senate just before Christmas. It didn't pass in the House, however, which was then controlled by Republicans. A similar proposal was also suggested by Sen. Lindsey Graham, R-S.C., in mid-January, saying at the time that he hoped a bipartisan group of senators would "basically ask the president jointly to give us a few weeks to work on this, with you, to see if we can produce a result in the Senate," Graham said. The president rejected the suggestion days later. 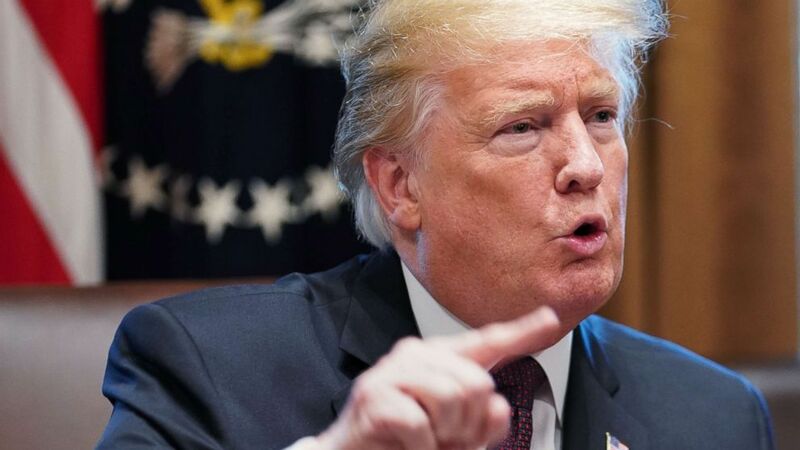 (Mandel Ngan/AFP/Getty Images) President Donald Trump speaks during a round table meeting with conservative leaders at the White House on Jan. 23, 2019, to discuss the security and humanitarian crisis at the southern border. When asked on Tuesday evening whether the president would support the proposal were it to pass in the Senate Thursday, White House press secretary Sarah Sanders said the president has "laid out what he’d like to see” in his own proposal. Sanders also said the president intends to go forward with the State of the Union address, which the president himself confirmed in a letter knocking down House Speaker Nancy Pelosi's stated concerns about guaranteeing proper security during a shutdown. 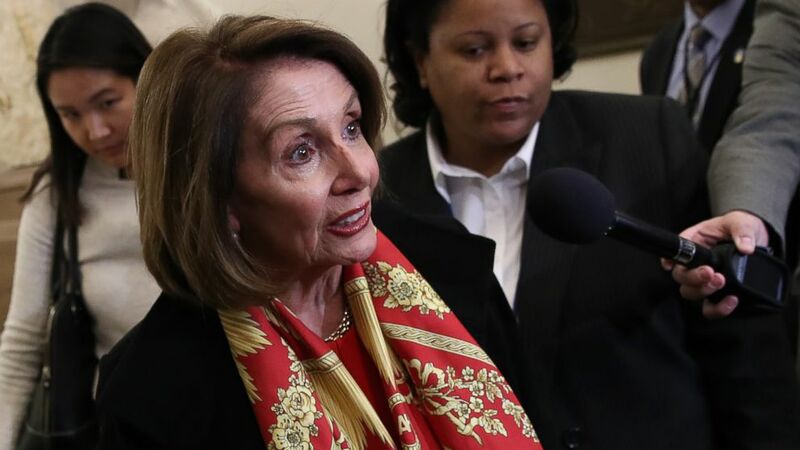 The back-and-forth continued Wednesday afternoon, however, when Pelosi responded that she would effectively block the president's speech in the House chamber until the government was reopened. (Win McNamee/Getty Images) Speaker of the House Nancy Pelosi talks to members of the press about President Donald Trump and the State of the Union speech while she returns to the U.S. Capitol on Jan. 23, 2019 in Washington. In the meantime, problematic circumstances continue to manifest as 800,000 federal workers and the agencies they support hang in the balance of the political conundrum. 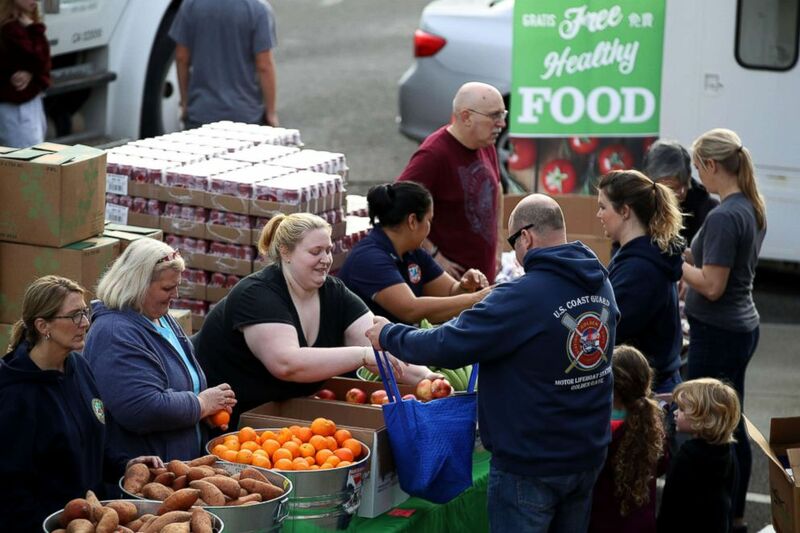 (Justin Sullivan/Getty Images) U.S. Coast Guard families receive free groceries during a food giveaway on Jan. 19, 2019 in Novato, Calif.
Tens of thousands of workers have been called back by the Trump administration to mitigate the effects of the shutdown, though many federal agencies have seen increasingly high numbers of employees calling out because of financial hardship. A major union that represents many IRS workers, the National Treasury Employees Union, said there is an agreement for the workers it represents that allows for a hardship exemption during a shutdown. Agency management is “doing its best to accommodate the very real hardships employees are experiencing,” NTEU National President Tony Reardon said in a statement, though the shutdown and the skeletal workforce has brought on concerns that tax refunds will be delayed. "The pain of the government shutdown is deep for IRS employees, and all of the federal employees who are going without pay in the fifth week of the shutdown," Readon said, calling on Congress and the administration to "pay federal workers and bring this shutdown to an end." 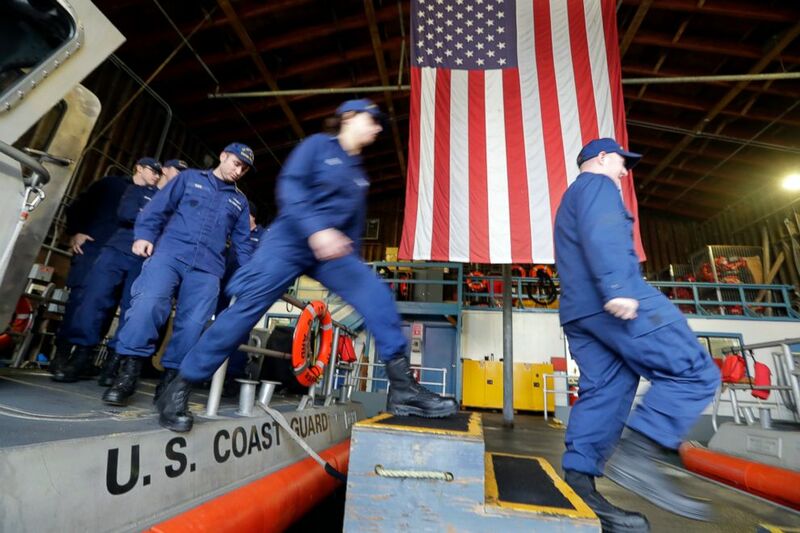 (Elaine Thompson/AP) U.S. Coast Guardsmen and women walk off a 45-foot response boat during their shift at Sector Puget Sound base in Seattle, Jan. 16, 2019. The same plea has come from other groups, including the Coast Guard. Adm. Karl Schultz, the Coast Guard commandant, has been outspoken about the harm the shutdown is causing men and women in the U.S. Armed Forces. On Tuesday, he called it "unacceptable that Coast Guard men and women have to rely on food pantries and donations to get through day-to-day life as service members" in a video posted a video on Twitter. Meanwhile, the national president of the country’s largest federal employees union was arrested on Capitol Hill Wednesday. American Federation of Government Employees President J. David Cox led a carefully coordinated group of demonstrators through the Senate halls to Majority Leader Mitch McConnell’s office. Cox was then escorted out of the Senate office building. “We are looking for the Majority Leader. I heard he’s afraid of Donald Trump,” Cox said before being loaded into a Capitol Police vehicle. U.S. Capitol Police say 12 people in total were arrested for unlawfully demonstrating. FBI Agents Association President Tom O’Connor also spoke out Tuesday, emphasizing the necessities provided by the FBI and the drain the shutdown has put on vital resources. "For FBI Agents, financial security is national security," O'Connor said Tuesday morning. O'Connor spoke at a press conference after the release of a report, "Voices from the Field," which highlighted the impact of the shutdown on agents in their day-to-day roles. O’Connor asked those in the room how they would fare with no pay for a month and still have to go to work. ABC News' Anne Flaherty, Quinn Owen, Stephanie Ebbs Luke Barr and Mariam Khan contributed to this report.